There’s a slight crispness in the early morning air in Kolkata, almost making it comparable to the nip we are so fond of in Bangalore. The after-effects of the strong showers from the last afternoon hasn’t caused Calcutta to give up it’s resilience in coming back with the briny, balmy humidity, even before the clock strikes 8am..
That’s autumn, a season which welcomes to the city the worship of a deity, who, we believe in all might, has slain the evil, and brought harmony and good to the world. 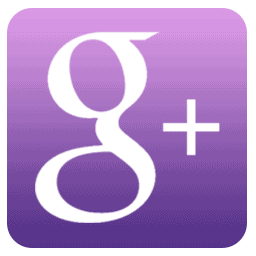 It’s the season of amiable abundance; a time for religion, art and business to blend together. Revellers and late night troopers will once again create frenzy in the streets. The smell of something divine will fill the air with the promise of a much-awaited celebration. Crossroads and street markets will be teeming with eager, restless, swearing and overenthusiastic last-minute shoppers. 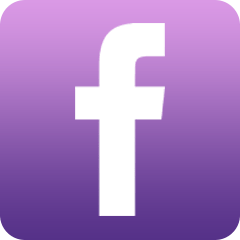 And soon the city will turn into a mix of religious event, a cultural occasion, a music festival, a literary fair, a food festival, a fashion show — all rolled into one. Nothing short of a carnival! 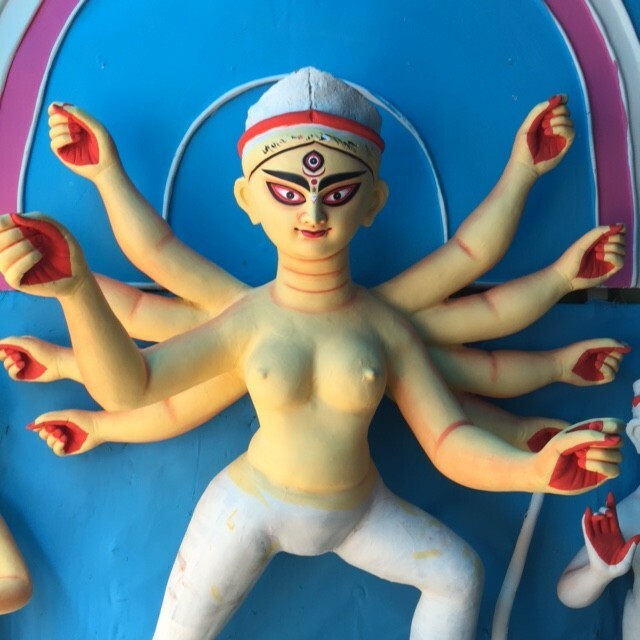 Bengal is in a hysterical excitement to welcome its beloved daughter, Durga, to her maternal, worldly home..the ‘City of Joy’ will now forget it sorrows and revel in its own pandemonium, unmatched by anything else and… live up to its name! What Montmartre is to Paris, and SoHo to New York, is what Kumortuli is to Kolkata. 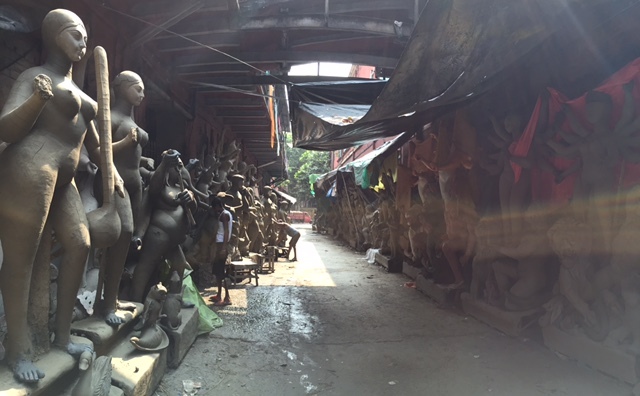 Nestled in the lap of north Calcutta’ ornamental past, is a potters’ quarter called Kumartuli. 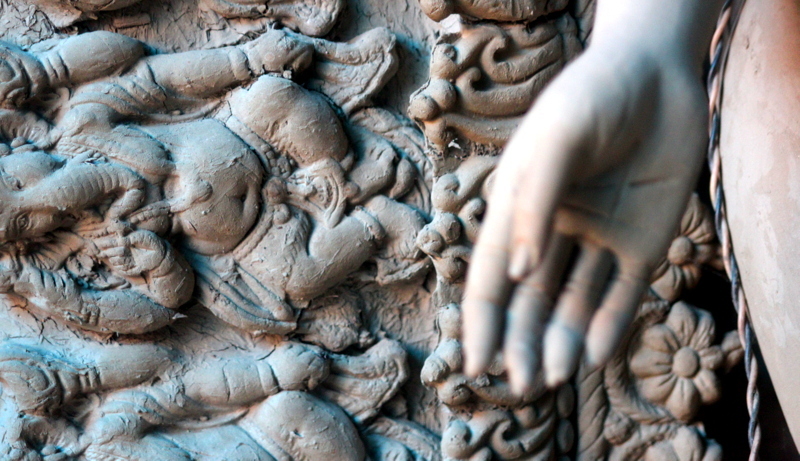 Its winding lanes are home to an artistic community that carry on a centuries-old tradition- making idols of the Gods. Following the British colonization of Bengal in the eighteenth century and the creation of the settlement that would become the teeming metropolis of Kolkata, workers in various industries were allocated quarters. These warrens soon became identified with the activity carried out within them. For example, in Bengali “kumor” means “sculptor” and “tuli” means place. Separate districts were allotted to the Company’s workmen – Suri-para (alcohol locality) for wine sellers, Coll-tollah ( machine locality)for folks dealing in oiling machines, Choottor-para became carpenters hub, Aheer-tollah – cowherd’s quarters and Coomar-tolly for potters. 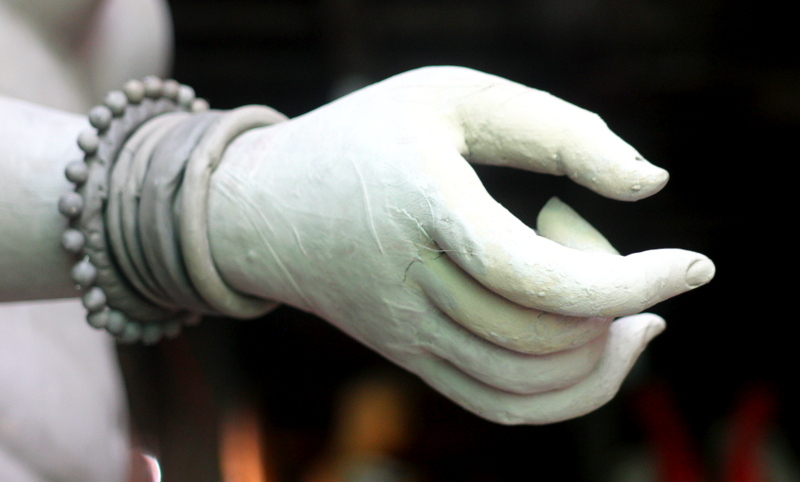 It is here in Kumartuli that human hands started giving birth and shape to the divine, over the years. The narrow lanes are now flooded with mud figures, and a bevy of artists bring them to life. 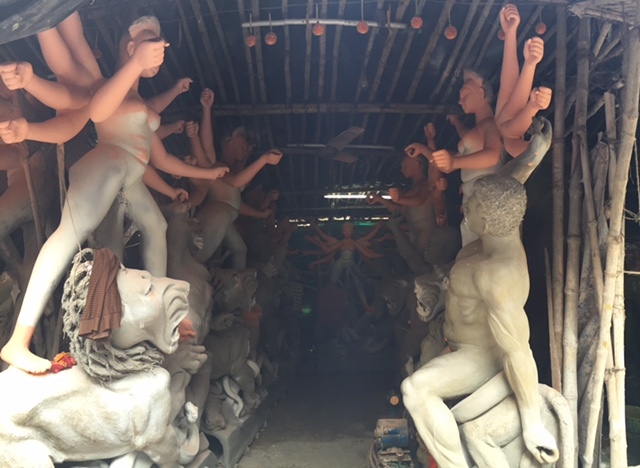 And needless to say, Durga Puja is the most elaborate and important for the potters: the rotund Ganesh, the handsome Kartik, the riveting goddess Lakshmi, the serene one Saraswati and the majestic Durga, jostle for space in the labyrinth of Bonomali Sarkar street, the nerve center of Kumortuli. 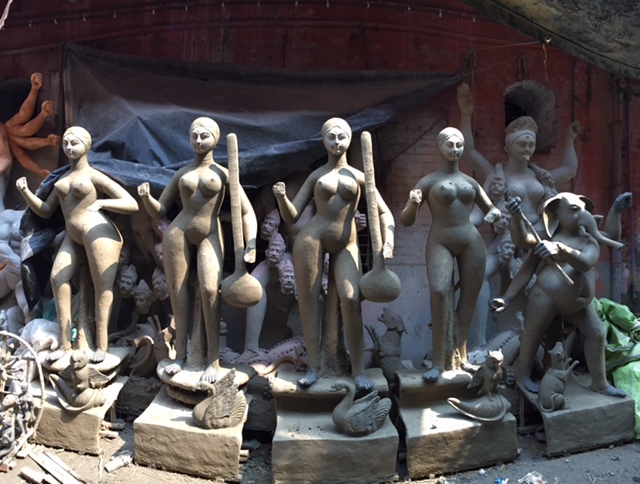 Flanked by cavernous workshops that are packed with large idols of Durga and her four children in various stages of completion, wiry artisans squat on the street, kneading the clay or working on smaller idols, ignoring the attention of curious passersby and amateur photographers. “You are taking photos… do you have a ticket?” a voice warns me from behind a partially opened door!“You’ll have to buy one.” It’s about 8am in the morning, and the workshops are slowly opening its doors. Sitting atop a wooden tool in a workshop that is crammed with incomplete clay images of the goddess, the elderly artisan, clad only in a soiled lungi, is almost apologetic when he says that and hands over the pink slip, and provides a short explanation on how this is so that there isn’t damage done by careless photographers who aren’t cognizant of where their tripods are poking and kit bags are protruding! It’s strange how you find art everywhere in Kolkata. Like Rome. Or London. Kumortuli is a great example of how the mundane in Kolkata can be so terribly artistic. 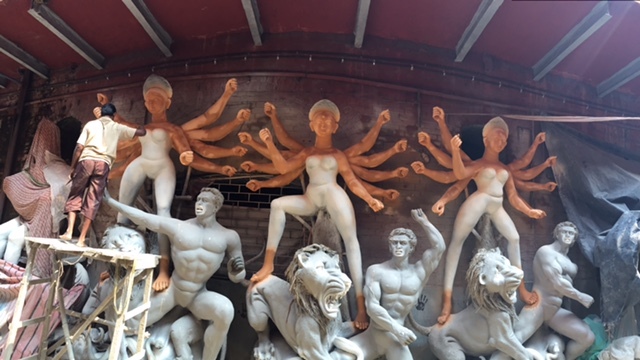 It appears making Durga idols is not just the livelihood of the people living in this tiny neighborhood- it is a way of life that embraces creativity . But the best of creativity springs up from areas that don’t have an ecosystem nor a conducive environment for artists to thrive. And this area is no exception. They create, and they live their lives in shambles. 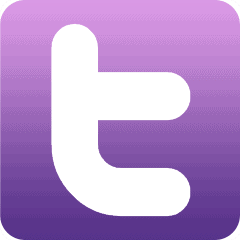 Every aspect is geared to suit their livelihood. Their professions engulf their lives. In every narrow lane and tiny alley you see piles of hay stacked outside homes, bags and bags of plaster of Paris kept in makeshift sheds, mounds of clay lying around. There are also umpteen number of shops selling shiny accessories and garlands, all of which go to adorn the deity, including fabrics, silk and satin stocked on shelves in these crowded shops. And in-between all this are vignettes of daily life-There is the grumpy , sickle-bent elderly woman peering curiously from within a shack; a little boy in all his agility prancing through the alleyways playing peek-a-boo; an old man in a red and white checkered loin cloth( we call them ‘gamchas’)settles on a stone and pours water from a rusty tin bucket to begin a morning ritual of washing and scrubbing. The household women hurl an assortment of clothes across makeshift washing lines high above their rooftops which soon begin to billow in the gentle breeze that blows in from the river. There is the friendly younger generation lad using the reflection of a hand mirror to shave his beard while his young doe-eyed bride makes rutis/cooks rice over the ‘unoon‘. And then there are the artists- toiling away at the clay in their hands. Dexterous movements, moulding with expertise; mixing, trimming, chipping, pinching, slabbing, coiling away. Even when they pause to look up, their hands don’t stop! They keep at it…kneading, shaping, patting the clay, mixing water bit by bit. “This is commissioned by the neighborhood that has the statue of Kumar Sanu in their local park”, says an elderly artist, with thick framed specs dangling precariously at the tip of his nose. “The statue was feeling lonely; so they wanted his wife’s statue beside it!” .. he himself giggled at how preposterous some customer demands can be. There are about 500 odd workshops near Kumortullly Pally— that are run by families that have been into idol-making and pottery for generations. During the Puja season, they hire extra hands from across the smaller settlements of Bengal because making the idols of Goddess Durga is a grand affair. 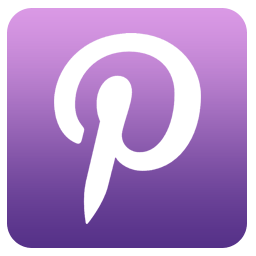 The goddess, after all, does not like to be presented alone in a pandal: she must be accompanied by her four children, not to mention the lion she rides and the curly-haired, muscular demon she is shown slaying. 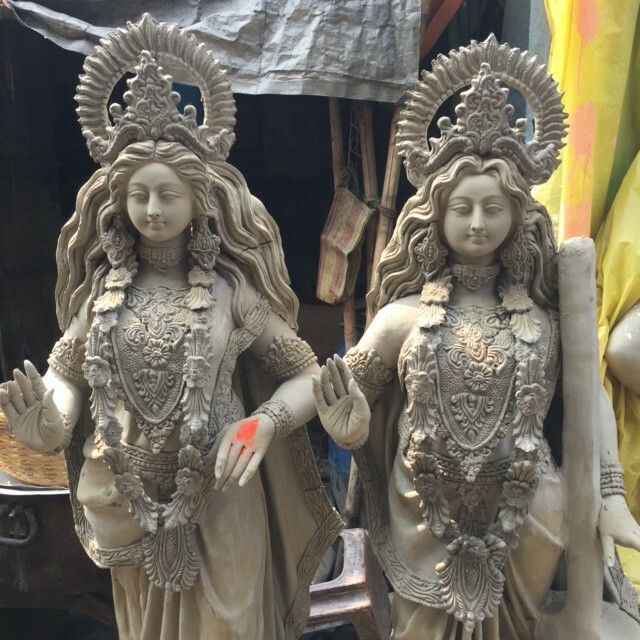 And with Kolkata extending its arteries and with Bengalis reaching newer shores across the globe, the demand for idols has gone up over the years. ” This one will be shipped to Germany tomorrow”, says Neepa Dey. Another tiny Ganesh idol was being packed, and I was forbidden to click that, as it was due for an award later that week. 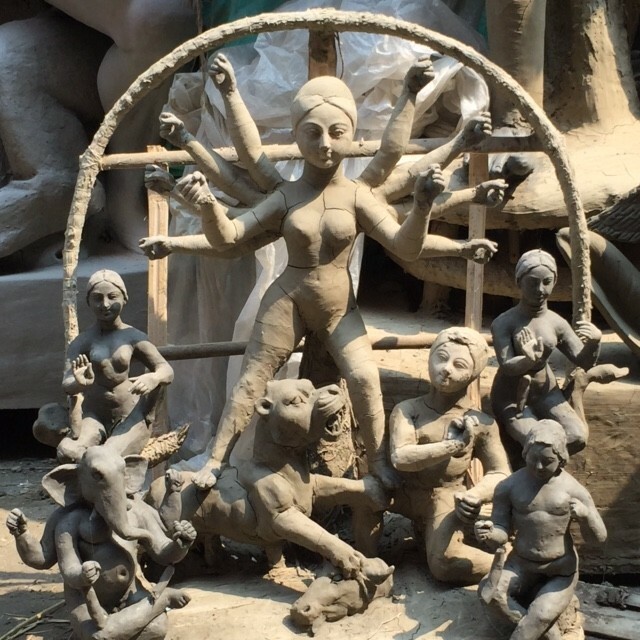 Kumartuli is known to create close to 4,000 sets of Durga idols every year, and that calls for a lot of work — work that demands perfection, attention to detail and creativity. 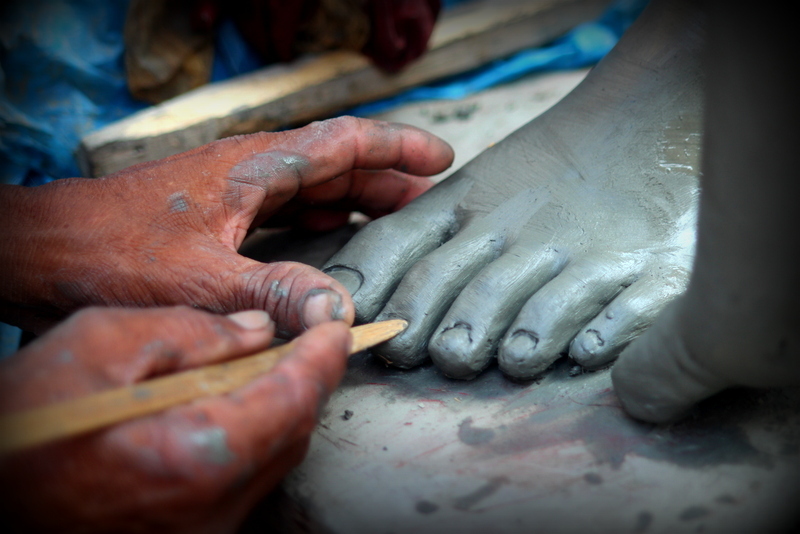 Several artists are busy applying clay on the protruding bellies or bosoms. One of them is in a meditative state as he works on the goddess’ fingers. 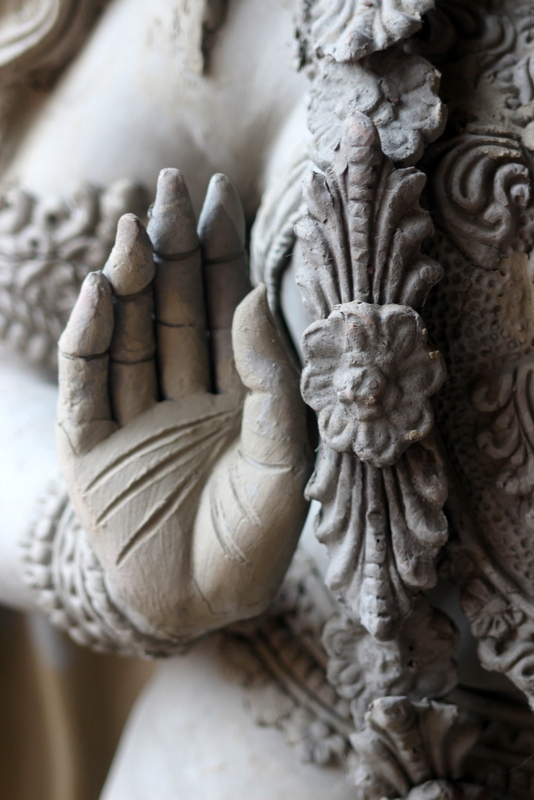 Strewn on his table are a set of clay fingers, each large enough to befit the 12-ft idol. He picks them up, one by one, and delicately runs his fingers on them to impart them his masterly touch, to make them look as human as possible. The Goddess is getting a manicure done, and soon will get a pedicure! A typical Kumortuli idol, is made of bamboo and hay — the bamboo serving as the skeleton and hay the flesh. Once the structure is ready, it gets a skin of entel maati, a sticky variety of clay procured from the bed of the Hooghly. 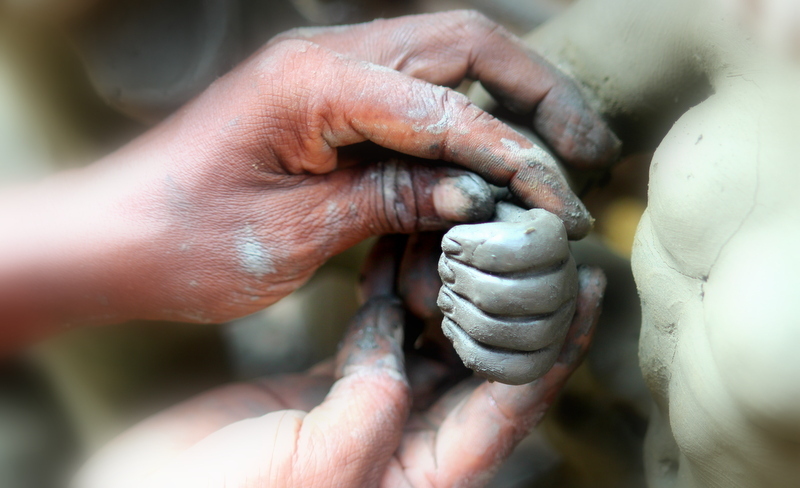 Once it dries up, the finishing touches are given with bele maati, a finer variety of clay which also comes from the river. The idols are always pre-ordered and never sold off-the-shelf. Every Kumortuli family is rigid about the time, place and quality of the earth picked up from different places in Uluberia, especially where the river flows towards the south. The special kind of straw used for the basic ‘flesh’. The bamboo comes from Murshidabad and is kept immersed in water near Baranagar so that termites cannot enter the hollows. The painting in of the eyes of the Mother Goddess has ritualistic connotations. 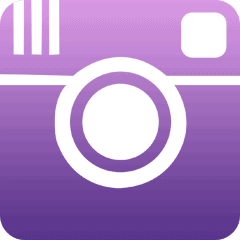 “We must take a bath and wear fresh clothes before we begin to paint in the eyes. The oldest in our family gets the honour to do this”, says Madhusudan, an almost septuagenarian artist, proudly smiling and pointing his index finger towards his chest . There is a certain naivety and innocence in the voice of these koomors . They make their work sound like religion. Things like these that amaze and dazzle me every time I visit my city. Rabindra Sarani, the biggest road, just outside this labyrinth is now buzzing with activity at 10am. Most shops are open. The sporadic traffic lays bare the pair of glistening tram lines stretched out on the road. Running on them now, however, are not trams but the occasional taxi and autorickshaw and, of course, the human horses — lungi-clad, weather-beaten men pulling rickshaws with the strength of their bones. I munch some hot kochuri and spicy aloor dom, hot off the stove. The perfect Sunday breakfast. Even after so many years of being attached to my city, one would think I am biased. But the beauty actually lies in the fact that it still provokes me to be judgmental. The intense kinds, that you can be, only when you are passionately in love with someone. I realized, my first feeling for Kolkata still depends a lot on how I enter the city. If I come in a train and alight at the Howrah station, I drive into a city that is a captive of its own long-standing demeanor — the epochal bridge, the caterpillar trams, hand-pulled rickshaws, pavements turned into living-rooms and bedrooms by poor migrants, frail colonial-era buildings emitting a whiff of heritage and fade. It’s a warm and simple feeling. Like a cup of sweet tea in a hill station. On the contrary, if I fly down to Kolkata and take the Rajarhat Road into the city, the landscape is utterly different, and so are my feelings: upscale high-rises, state-of-the-art offices of IT giants, jazzy malls- that make me amazed, cautious and smart. North Kolkata, where lies the roots of the city, is still a stranger to me continuing to awe me like the kid at a toy store. It is still the dynamic living museum of the era just gone by, totally reminiscent in the Calcutta I have seen in black-and-white Bengali movies, while growing up… and Kumortoli was just a perfect example.